All-day conference attracting over 550 professionals throughout the state from non-profit organizations, major funders, corporate sponsors, exhibitors, government officials and consultants. 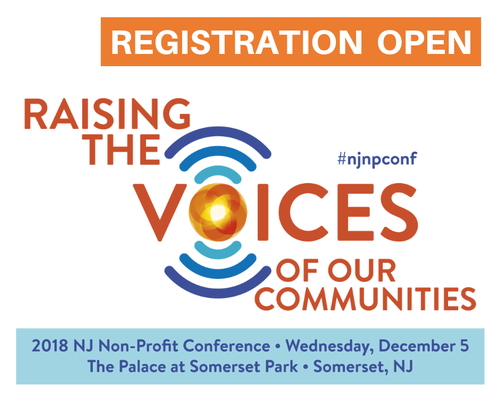 This year’s theme Raising the Voices of Our Communities, will focus on aspects from advocacy and movements, diversity and equity, listening to and engaging with constituents, communications and visibility, and so much more, to ensure that all of the different types of “communities” non-profits serve are reflected in our missions, deeds, and impact. In addition to 22 breakout sessions for every member of your non-profit team, the day includes two keynotes from nationally-known speakers and an after-event reception. $140 - $199 early registration through October 19, $185 - $265 through November 25, Late fee charge $25 added on November 26 (Full-day scholarships available).